I recently made two special birthday cards for a friend - one for me to give her and one commissioned by her husband to give her. This is the one I gave her. 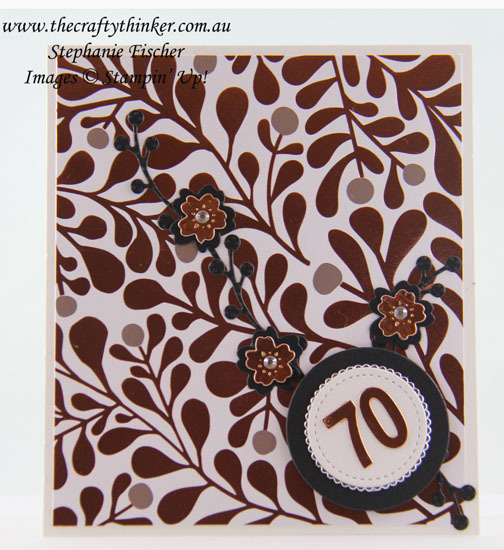 I added a piece of the gorgeous Year of Cheer Specialty Designer Series Paper from the Holiday Catalogue (available from 1 September 2017 to 2 January 2018) to a Whisper White base card (I used the thick Whisper White cardstock). The foliage fronds are cut in Basic Black using one of the Flourish thinlits to which I added flowers cut in Basic Black and Copper Foil Sheet using dies from the Bloomin' Heart set with Basic Rhinestone centres. Year of Cheer Specialty Designer Series Paper is for so much more than Christmas! I cut some Basic Black cardstock with one of the Layering Circles framelits and another with one of the scalloped dies from the same set with Silver Foil Sheet. The Whisper White circle is cut with one of the Stitched Shapes framelits. 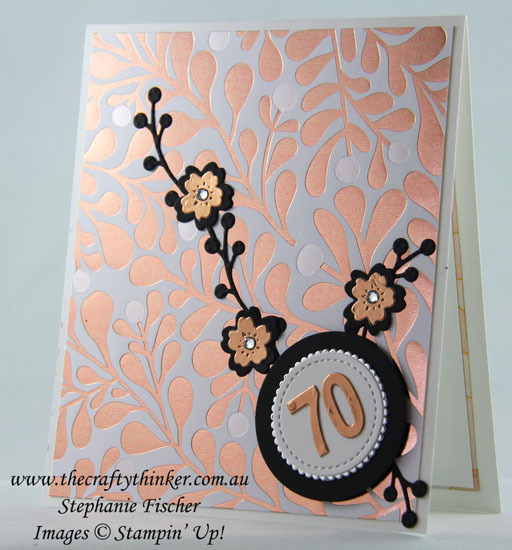 The shiny copper and silver in the Year of Cheer paper is beautiful! 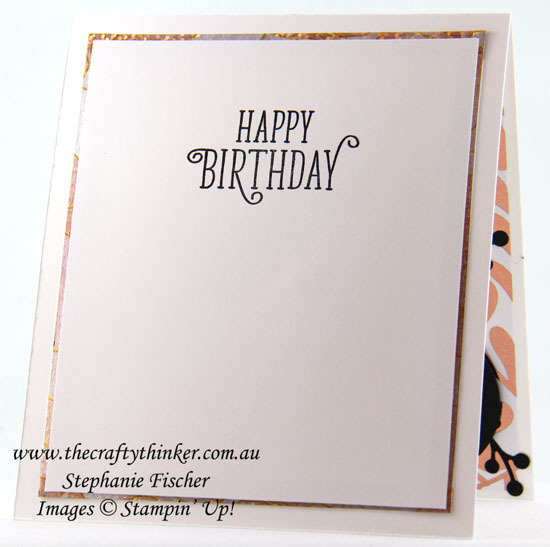 Unfortunately the dies I used for the little numbers are now retired but I do used them from time for special birthdays because they tend to be the perfect size for my cards! To decorate the inside of the card, I edged a piece of Whisper White cardstock with some Year of Cheer Specialty Washi Tape. This will be available from 1st September in the new Holiday Catalogue.